Principal Investigator Lilikalā K. Kame'eleihiwa is a senior professor at the Kamakakūokalani Center for Hawaiian Studies at the University of Hawai'i at Mānoa, and formerly the director from 1993-1994 and again from 1998-2004. Trained as a historian, she is also an expert in Hawaiian cultural traditions, and in the Hawaiian sovereignty movement, and has served as executive producer of the 2005 DVD Natives in New York, Seeking Justice at the United Nations, and as co-scriptwriter of the 1993 award winning documentary An Act of War: The Overthrow of the Hawaiian Nation. Her books include Nā Wāhine Kapu: Sacred Hawaiian Women , He Mo'olelo Ka'ao o Kamapua'a: A Legendary Traditional of Kamapua'a, the Hawaiian Pig-God , Native Land and Foreign Desires: Pehea Lā E Pono Ai? , and Māui: the Mischief Maker .Fluent in Hawaiian, she has served as protocol officer and crew for the double hulled Polynesian Voyaging Canoes Hōkūle'a and Hawai’iloa and, with master navigator Nainoa Thompson, has written the first year long course in Traditional Navigation offered at any university in the world. Since 1987, she has written another 20 courses in Hawaiian history, mythology and culture for the Center for Hawaiian Studies. Her course, Hwst 107: Hawaiʻi, Center of the Pacific, has become the most popular course ever taught at the University of Hawaiʻi at Mānoa, and is currently offered annually to 6,405 students in 187 class sections on 9 UH campuses. Her most recent research, AVA Konohiki, is focused on Ancestral Knowledge and Food Sustainability, especially for the island of Oʻahu where she was raised. Formerly known as an ʻĀina Momona, or a land ʻFat with foodʻ, Oʻahu had extensive loʻi kalo systems in each of its 81 ahupuaʻa. Today Oʻahu is so heavily urbanized that 95% of our food is imported from the continent, but with oil becoming scarcer, it is critical that we seek ancestral efficiencies in feeding people. In the first two years of the study, and in conjunction with brilliant cultural retreats lead by Dr. Pua Kanahele and her Papakū Makawalu team, Dr. Kameʻeleihiwa has learned that ahupuaʻa are surface water management systems, and that moku districts are likely boundaries of subterranean water aquifers. Not only did the extensive loʻi kalo [wet-land taro] systems increase food production 10 fold, but they were critical to the recharge of the aquifer. Moreover, in 1900, Oʻahu had 4,000 acres of both fresh and salt water ponds , creating the most efficient sources of protein in the Pacific, also contributed substantially to aquifer recharge. Water management is the key to producing food to feed our people! Dr. Kameʻeleihiwa reminds us that Hawaiians are doubly blessed in that they have oral histories going back 100 generations, still celebrate their ancient traditions, especially those used in celestial navigation and in sustainable lifestyles, and that when all of the Hawaiian newspapers are digitized, there will be one million more pages to read of Hawaiian ancestral wisdom. What an excellent time to be a Hawaiian academic! Pua is of pure Hawaiian descent and is responsible to her ancestral lineage. She was raised in a Hula tradition that spans many generations. Pua is also responsible to this matrilineal tradition. She knows the forest, mountains, volcanism and the ocean of her homeland from her Native Hawaiian perspective. These too are her responsibility. She was educated in Western institutions and earned a Bachelor of Arts Degree. At the age of 69 in the winter of 2006 Pua received a Doctor of philosophy Degree from the University of Hawai’i at Manoa. She understands this formal Western Education system and is responsible to its philosophy, concepts and the points of view noted in the process of direct learning. Pua is the President of Edith Kanaka’ole Foundation, a small family foundation that focuses on promoting and elevating cultural knowledge and intelligence. Pua is the creator of Papaku Makawalu, the Hawaii process for intellectual and spiritual understanding of our Hawaii environment. She is a Kumu Hula for Hālau o Kekuhi, also a family Hawaiian traditional dance school. Pua is Director of Hawaiian Traditional Knowledge Research with Hawai’i Community College. Kalei Nu'uhiwa was born and raised on Maui. She was the first Masters degree graduate of the University of Hawai'i Mānoa - Kawaihuelani Center for Hawaiian Language. She has worked and volunteered with the restoration of the island of Kaho'olawe with both the KIRC and the Protect Kaho'olawe 'Ohana. Her primary discipline is Papahulilani -- the study of all aspects of the atmosphere -- its phenology, energies, and cycles from a Hawaiian perspective. In the traditional Hawaiian world view, these atmospheric elements embody the pantheon of kino akua Hawai'i, and provide a fundamental function in ancestral memory, still essential in the modern Hawaiian consciousness. She works as one of the Researchers for the Papakū Makawalu Project with the Edith Kanakaole Foundation. She coauthored the Papahulilani section of the cultural use plan for Kanaloa-Kaho'olawe: Kūkulu Ke Ea a Kanaloa, Kūmokuhali'i - Forest Resource Cultural Use Plan & the Keauhou Kahalu'u Educational Cultural Use Plan for Kamehameha Schools. Working with the Kamehameha Schools, Keauhou-Kahalu'u Education Group, community groups, & cultural practitioners, Kalei continues to research and build understanding of the significance of site placement and use within the historical corridor of Kahalu'u, Kona. She maintains ongoing studies of celestial alignments with sites situated in the North West and main Hawaiian islands, to understand traditional tracking of time and spatial measurements. Kalei utilizes all the traditional data in her monthly self published newsletter with aspirations to assist others with their own recordation and data collection of their own environmental happenings in Hawai'i. Kuʻulei Higashi Kanahele is a hula practitioner with Hālau o Kekuhi of Keaukaha, Hawaiʻi. Hālau o Kekuhi is recognized for its ‘aihaʻa, a strenuous delivery of chants and dances of the Pele ‘ohana. Kuʻulei’s passion is the study of Hawaiian chants and text and she is fortunate to have the opportunity to pursue this study both personally and professionally with the Hālau and through various research projects with the Edith Kanakaʻole Foundation, including Papakū Makawalu. Kuʻulei is a 1994 graduate of the Kamehameha Schools, with a Bachelor of Arts in Hawaiian Studies from the University of Hawaiʻi at Hilo and a Master of Arts in Education from Central Michigan University. Project Director Keali‘ikanaka‘oleoHaililani has trained in the tradition of Hula ‘Aiha’a for 35 years and has recently been ritually elevated to the status of Kumu Hula, of Halau o Kekuhi by her mother, Kumu Hula Pualani Kanahele and her Aunt Kumu Hula Nalani Kanaka’ole. Halau O Kekuhi was founded by their ancestors whose lineage can be traced to the very beginnings of hula (according to Hawai’i Island traditions), to the Pele clan. Halau o Kekuhi, the formal traditional hula school named for Kekuhi’s grandmother, Edith Kekuhi Kanaele Kanaka’ole, has maintained two of the oldest oral and ritual arts traditions of Hawai’i culture, hula and oli. 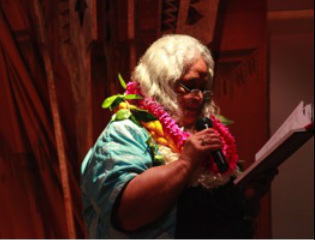 Under the direction of her mentors, Kekuhi has co-produced some of Halau O Kekuhi’s most significant contributions to oral and ritual arts performances. Kekuhi Kanae Kanahele Keali‘ikanaka‘oleoHaililani volunteers her time as the Executive Director of the Edith Kanaka‘ole Foundation, a family foundation dedicated to heightening and expanding indigenous Hawai’i consciousness through oral and ritual arts and traditions and education. I was born January 1, 1971 in Oklahoma City. 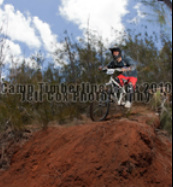 After graduating from High School I moved to Hilo Hawai’i. I received my Bachelor of Arts in Psychology with a minor in Hawaiian Studies from the University of Hawai’i at Hilo. I have worked with the Edith Kanaka’ole Foundation or one of its projects since 1998. I gave birth to twin boys in 1993 and twin girls in 2001. It is through the desire to contribute to the community and ensure a good education for my children that I began volunteering in the community and serving on Local School Boards and parent groups. I have held my current position as Executive Assistant at EKF for 9 years. My formal education includes a B.A. in English, an A. A. in liberal art, an A.S. in accounting, and a Hawaiian Lifestyles Certificate from Hawai’I Community College in Hilo. I was born in St. Paul, Minnesota and raised on the west coast of Oregon. I have worked in many fields. My other interests include volunteering my services for a non-profit organization called Nā Maka Hāloa as secretary and bookkeeper. Nā Māka Hāloa is an organization which provides education, life skills and opportunities for the Native Hawaiian community and cultural practitioners. I am also a volunteer bookkeeper for a for-profit company that services Native Hawaiians in the prison system. I previously danced with a hula hālau (dance school) and am currently taking lei hulu (feather lei making) classes. Aloha ʻĀina Kākou. My name is Donovan Preza and I currently live in Moanalua, Kona, Oʻahu. In addition to my work on this project I am also a P.H.D student in Geography at Mānoa. Both my M.A. and B.A. are also in Geography. My research interests include the Māhele of 1848, ahupuaʻa, Hawaiian land tenure and ʻāina. This project has helped to remind me of the numerous cycles, rhythms and constance that nature provides which has been a valuable lesson for my own personal growth. Employed as Reservations Department Manager at Hawaiian Airlines, Inc. for 22 years; served 3 years as Protocol Specialist for the State of Hawaii, Governor's Office of International Relations. Worked for the State of Hawaii, House of Representatives, Finance Committee for 9 legislative sessions. Retired from the State of Hawaii after 5 years of service to the Department of Hawaii Community Development Authority, land managers for Kaka'ako and Kalaeloa. From Kāne'ohe, Hawai'i, Jenny is a 1999 Honors graduate of Castle High School, and a 2003 graduate of BYU Hawaii with a Bachelor of Science Degree in Information Systems. In 2005, Jenny served as an ESL teacher at King Intermediate School. After exemplary performance and only one year of teaching, Jenny was selected as the "ESL Teacher of the Year". As a mother of three, Jenny is committed to family, earth school learning and contributing as a board member for Ke Ala o Kapiko, an NPO whose mission centers on the restoration of Lo'i, 'Ike Hawai'i and 'Ōlelo. Her experience as a student and teacher of the DOE has enlightened her to injustices and sufferings facing Kānaka. Jenny, recently graduated with her Second Bachelors Degree in Hawaiian Studies from University of Hawaii Manoa. She also is the AVA Website Development Team Leader. All of our konohiki in training are students of outstanding academic achievement at the University of Hawaiʻi. Each student has been hand-selected to be trained in the methods of researching and practicing the resource management and food sustainability life ways of our ancestors. Donna Ann Kamehaʻikū Camvel comes from the ʻili of ʻIolekaʻa in the ahupuaʻa of Heʻeʻia, where her ʻohana has maintained their family kuleana since 1839. She attends the University of Hawaiʻi at Mānoa, where she received Bachelor's degrees in Women's Studies and Hawaiian Studies, and she recently completed her Master's degree in Hawaiian Studies. She has been accepted into the doctoral program in Political Science at UH Mānoa, and will specialize in Indigenous Politics. She is a mahiʻai wahine, makahiki practitioner, and a konohiki in training, to be of service to her family and community. Raymond Kaimana Estrella is currently a Hawaiian Studies Master's Student at the University of Hawaiʻi at Mānoa. Kaimana has a very deep interest in cultural land knowledge and investigating ways in which Hawaiians can be self-sustainable. His thesis is centered around his family and the moku of Koʻolauloa. Kaimana hopes that the work accomplished through this grant will not only provide Hawaiians with valuable land, ecosystem and food production information but also with the insatiable curiosity and interest of history and genealogical ties to the ʻĀina. Aloha mai kākou, my name is Mariah Kuʻuleialohaokaʻalamaile Flanigan-Garcia, but you can call me Kuʻulei. I was born in Wahiawa, but raised in Waiʻanae. I graduated from Nānākuli High School in 2009. I began enrollment at the University of Hawaiʻi at Mānoa in Fall 2009. I am currently a Senior, and double-majoring in Hawaiian Language and Hawaiian Studies- Kumu Kahiki. I love doing genealogy research about my family and connecting with family members. While growing up, I was never aware about the Illegal Overthrow of our kingdom, the banning of Hawaiian Language, etc, until I started attending UH Mānoa in 2009. The Hawaiian language stopped with my great-grandfather, Louis Lonoaeʻa; my grandmother and her siblings were not allowed to learn anything about our culture, and therefore, this ancestral knowledge, was almost forgotten in my ʻohana. I am so grateful that nā Akua blessed me with this opportunity to learn about the knowledge of our kūpuna. This is my first time being exposed to the Māhele land award documents from the state archives, and being able to learn about it, is just amazing. My lifetime goals is to learn as much as I possibly can about our culture and try to change the world in some way before I hala. I hope to one day change the curriculum in all public and private schools in Hawaiʻi, where students' graduation requirements would be altered. I want to create a curriculum based around the lessons within Hawaiian language and Studies. I am still thinking about this plan, but I know it in my naʻau that we can change the world. Mae Pa‘iekūlani Mahinaarangi Jeremiah-Wong was born and raised in the ahupua‘a of Hauʻula and Kahuku in the moku of Koʻolauloa, on the island of Oʻahu. Born of Maori and Hawaiian parents, Kūlani desires to be of service to both her cultural communities. 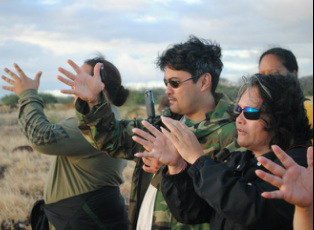 As a current Graduate Research Assistant on the AVA Konohiki Land Grant, Kūlani has been given the kuleana to mālama Koʻolauloa. Kūlani is planning on attaining her Master’s Degree in Hawaiian Studies in the Spring of 2013 and will be applying for entry into an Indigenous Studies doctoral program in Aotearoa. Welina! My name is Cami Kameaaloha Kanoa-Wong, raised in Mānoa, district of Kona, Oʻahu. Currently I reside with my kupunakāne, kāne and two keiki in Waimānalo, in the district of Koʻolaupoko. I am an undergraduate student researcher working for Kamakakūokaʻāina in the department of Hawaiian Studies. When we have time, my ʻohana and I return to Kahoʻolawe, also known as Kohemālamalama o Kanaloa, to clean, revegetate and nourish the sacred land of our kūpuna. For this project, I am focusing on the moku of Koʻolaupoko, Oʻahu as well as the island of Kahoʻolawe because of ancestral ties to both places. Aloha Aina! Aloha. My name is Evan Laeha. I am an undergraduate student at Kamakakūokalani Center for Hawaiian Studies at the University of Hawaiʻi at Mānoa, set to graduate in December 2012. I am also a Kamehameha Schools graduate of 2004. I love riding waves, listening to & making music, food, and my wonderful ipo. However, I cannot dance and please don't take me anywhere high. Mahalo. Aloha mai kākou! ‘O Aubrey Keʻalohi Matsuura koʻu inoa a no ke ahupuaʻa ‘o Hāliʻimaile ma ka moku ‘o Hāmakuapoko i ka mokupuni ‘o Maui mai au. I am a recent graduate of Hawaiʻinuiākea, both Kamakakūokalani, Center for Hawaiian Studies and Kawaihuelani, Center for Hawaiian Language. Currently I am a student of Hoʻokulaiwi through the Masters of Education in Teaching program. I am a graduate research assistant for Kamakakūokaʻāina, Ancestral Visions of ‘Āina. To know our land is to know our potential as people, to regain our ʻāina that we will mālama, to be able to grow our own food, and most importantly continue to teach our keiki the importance of land. Aloha mai kākou, ʻo au iho nō ʻo Sean Kanoa Luluʻupuakauikawēkiu O'Connor. No ka ʻili ʻāina ʻo Leaha mai au, ma ke ahupuaʻa ʻo Kalihi, ma Kona, Oʻahu. I am currently pursuing an M.A. in Hawaiian Studies at UH Mānoa. I have the honor of joining the AVA team in my second semester where I hope to grow as a researcher and a practitioner of our ancestor's ingenious ways of life. No doubt, ua lehulehu a manomano ka ʻikena a ka Hawaiʻi. I love to learn and eat, which are traits that undoubtedly link me to my kupuna. Mahalo for reading. A daughter of Haumea, and student of the Papakū Makawalu Methodology. Kaʻāhiki is a non-traditional Graduate Student working towards her Masters Degree in ʻIke Hawaiʻi (Hawaiian Studies) where she will be graduating in Spring 2013. She taught Hawaiian Studies 107 Classes for 4 years at Hawaiʻinuiākea School of Hawaiian Knowledge and is currently working as a Graduate Researcher on the Kamakūokaʻāina, AVA project. Her specialization is the Ahupua'a of Wainiha on the mokupuni of Manokalanipō (Kauaʻi), the one hānau (birth sands) of her Kūpuna (ancestors). Kaʻāhiki is an active member of the Kūaliʻi and Pūkoʻa Councils at the University of Hawaiʻi at Mānoa, two groups that advocate for Native Hawaiian Advancement. Kaʻāhiki's favorite ʻōlelo noʻeau is "Mai makaʻu i ka hana, makaʻu i ka moloā." Do not fear work, fear laziness. She feels this ʻōlelo noʻeau is fitting for one that is immersed in learning to walk in the footsteps of our Kūpuna. Aloha kākou, mai ke kai nalu o Kaʻena a i ka lā kapakahi ʻo Waiʻanae, ola kēia i ka makani Kaiaulu. ʻO Natashja Wahineʻaipōhaku Tomiko Tong koʻu inoa a he mamo haʻaheo au na Kuilei. My ʻOhana has been living in the Waiʻanae Moku for 6 generations, before then we lived from Kapālama to Waiʻalaeiki in the Kona district of Oʻahu, as well as Pukoʻo, Molokaʻi, Kaʻanapali, Maui and Kona, Hawaiʻi. I am currently in my second year of Graduate school at the Kamakakūokalani Center for Hawaiian Studies. I strive to raise my community and to apply all that I learn.